A new Rush CD and DVD are on the way, out Nov. 17. Relax Rush fans. As Alex Lifeson told Noisecreep a few weeks ago, the trio will not be back in the studio until next year. This release is 'Working Men,' their first 'best of' live performance compilation, available in audio only from Atlantic Records and the DVD from Rounder Records. Rush -- Geddy Lee, Alex Lifeson and Neil Peart -- have sold more than 35 million units worldwide, since forming in Toronto in 1974. Their last studio album was 2007's 'Snakes & Arrows,' co-produced by Nick Raskulinecz. 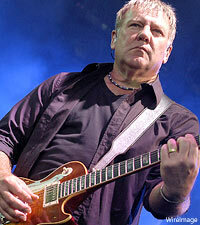 Lifeson told Noisecreep the band would love to work with him again.